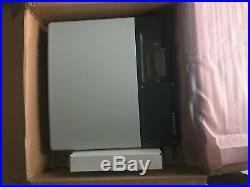 Brand New in box SMA Sunny boy 6000 TL-US-22 With DC Disconect. 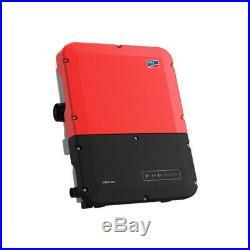 SMA Sunny Boy 6000TL-US-22 > 6000 Watt 240 Volt Non-Isolated String Inverter with Emergency Power Switch “switch not included”. The new Sunny Boy TL-US line of transformerless inverters features high efficiency and reduced weight along with both ground and arc fault detection per NEC 2011. An input voltage range of 175 VDC to 600 VDC and dual MPPT input dramatically increases module selection and string sizing flexibility as well as better production when parts of the solar array are shaded. A modern graphic display and an integrated DC disconnect switch are included. An optional Secure Power Supply feature enables these inverters to supply up to 12 A at 120VAC to a single outlet for recharging portable devices or a small UPS directly from the PV array. Optional RS485 or Webconnect data modules enable web-based system monitoring with SMA Sunny Portal. These transformerless inverters work with an ungrounded PV array topology so the requirements of NEC 690.35 must be followed, including using PV Wire for exposed array string wiring. Grid Tie – Central. 40° C – 60° C. Dimensions (W x H x D). Inverter: 19.3″ x 20.5″ x 7.3. Disconnect: 7.4″ x 11.7″ x 7.5. Inverter: 60 lbs Disconnect: 8 lbs. Recommended PV Power (STC). Peak Power Tracking Voltage. 210 V – 480 V. 208 VAC: 5200 W 240 VAC: 6000 W. 208 V / 240 V. 208 V: 183 V – 229 V. 240 V: 211 V – 264 V. The item “SMA Sunny Boy SB6000TL-US-22 Grid-Tie String Solar Inverter With DC Disconnect” is in sale since Friday, November 30, 2018. This item is in the category “Home & Garden\Home Improvement\Electrical & Solar\Alternative & Solar Energy\Chargers & Inverters”. The seller is “renewablees15″ and is located in Florida. This item can be shipped to United States, Canada, United Kingdom, Denmark, Romania, Slovakia, Bulgaria, Czech republic, Finland, Hungary, Latvia, Lithuania, Malta, Estonia, Australia, Greece, Portugal, Cyprus, Slovenia, Japan, China, Sweden, South Korea, Indonesia, Taiwan, South africa, Thailand, Belgium, France, Hong Kong, Ireland, Netherlands, Poland, Spain, Italy, Germany, Austria, Bahamas, Israel, Mexico, New Zealand, Singapore, Switzerland, Norway, Saudi arabia, Ukraine, United arab emirates, Qatar, Kuwait, Bahrain, Croatia, Malaysia, Brazil, Colombia, Panama, Jamaica, Viet nam, Uruguay. Grid Tie Inverter With Secure Power Supply. SMA has updated their residential inverter line with their all new Sunny Boy transformerless single-phase residential inverters. These new inverters now have up to three separate MPPT channels, allowing even more stringing choices. These inverters also now have an integrated DC disconnect, that simplifies and speeds installation. SMAs unique Secure Power Supply feature has been improved, and now can supply up to 2,000 W (15 A / 120 VAC) of power to a protected outlet during a grid outage, for recharging portable devices or a small UPS directly from the PV array. Connection to the SMAs Sunny Portal for solar array monitoring has also have been simplified. These SMA inverters are listed to UL 1741, UL 1998, UL 1699B, and are compliant with IEEE-1547, and FCC Part 15 (Class A & B), as well as both ground and arc fault detection per NEC 2011. CEC Rated Efficiencies of 96.5%. 2,000 W Secure Power Supply (requires dedicated outlet). Operating temperatures of -40 °F to +140 °F. Up to three MPPT input circuits 10 A max usable current (18 A max Isc) per MPPT input. Integrated AFCI for arc-fault protection. Available in sizes from 3 kW to 7.7 kW. Field selectable 240 VAC Single-Phase or 208 VAC three-phase output. Listed to UL 1741 and UL1699B for U. Compliant with: IEEE 1547, IEEE 929, FCC Part 15 A& B , CSA C22.2. The item “SMA Sunny Boy SB5.0-1SP-US-40 Grid Tie Inverter With Secure Power Supply” is in sale since Wednesday, October 31, 2018. This item is in the category “Home & Garden\Home Improvement\Electrical & Solar\Alternative & Solar Energy\Chargers & Inverters”. The seller is “renewablees15″ and is located in Florida. This item can be shipped to United States, Canada, United Kingdom, Denmark, Romania, Slovakia, Bulgaria, Czech republic, Finland, Hungary, Latvia, Lithuania, Malta, Estonia, Australia, Greece, Portugal, Cyprus, Slovenia, Japan, China, Sweden, South Korea, Indonesia, Taiwan, South africa, Thailand, Belgium, France, Hong Kong, Ireland, Netherlands, Poland, Spain, Italy, Germany, Austria, Israel, Mexico, New Zealand, Singapore, Switzerland, Norway, Saudi arabia, Ukraine, United arab emirates, Qatar, Kuwait, Bahrain, Croatia, Malaysia, Brazil, Colombia, Panama, Jamaica, Bahamas, Viet nam, Uruguay.